Help us to distribute it! For orders, please send us an Email. Welcome to "Save Our Seeds"
‘Save Our Seeds’ (SOS) is a European initiative in favor of the purity of seeds against genetically modified organisms (GMO). The initiative was created in 2002 by the Foundation on Future Farming and since then advocates no tolerance for contamination of seeds by GMOs. From this initiative hundreds of organizations and some thousand citizens of the EU have become affiliated with Save Our Seeds’ many activities. The projects combine the genetic engineering controversy and sustainable land and food sovereignty with an international perspective. 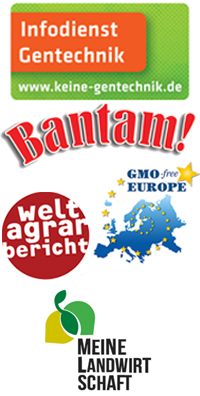 SOS organizes the yearly GMO Free Regions conference, leads the Bantam Mais action and is co-publisher of the Informationsdienst Gentechnik (GE Info Service). SOS was involved in the creation of the Weltagrarbericht (World Agriculture Report) and has shared its findings all over Germany. Together with many other organizations, SOS is responsible for the campaign “Meine Landwirtschaft – Unsere Wahl” (My Agriculture, Our Choice), engaged with the realignment of European agricultural policy after 2013. With its campaigns and initiatives, SOS networks with different organizations, companies, politicians, scientists, farmers, and interested citizens; and wishes to lead a productive debate towards sustainable change.